The Mister thinks they're crappy but I love them. Is your 'better half' supportive and encouraging of your op shopping addiction hobby? For more oppie treasures pop over here. How funny I have been thinking about posting this very question the last week. My DH is pretty supportive he just doesn't want the whole house styled retro/ vintage. He does draw the line sometimes looking through some "junk" as calls it. ooh Lea, they are lovely! My husband issue is that not only is he a 'better' op-shopper than me (he always finds stuff thats really cool or worth lots) he is also a hoarder (shed, garage, every nook and cupboard). It's been mylifes work so far to get him to part with enough of it that the hoiuse3 doesn't look like an oppy! My partner used to not like opping at all, but now he really likes it and is getting really good at it too. From my weeks finds he found the cast iron dish, both pieces of pyrex, silk tie and the suitcase... more then me. He's pretty good finding treasures in the crockery section and heads straight there every time. I can't complain :). 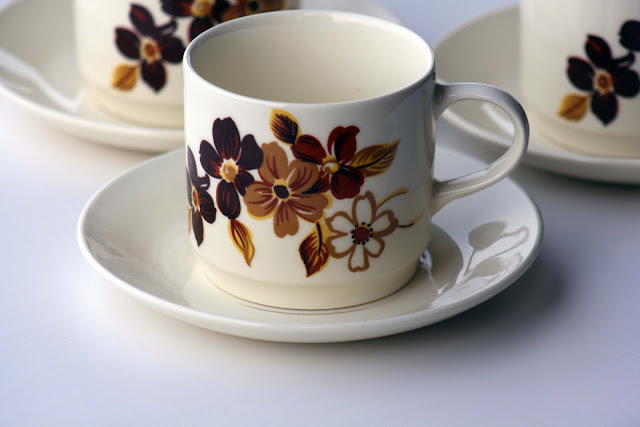 i like these little cups, very sweet, and the price... lovely! I love the colors in these cups. Great price, too! My husband is very supportive of my thrift shopping. He enjoys driving me to yard sales during yard sale season and I love having a driver! What a super bargain Lea...and they're so sweet! My husband and I do our vintage business together. And we often give each other a hard time when one of us buys something that the other thinks is stupid. Then, we get to say, "I told you so!" when it either sells or never sells! LOL! !